A cool way to hold up your pants is this Dancing Skeletons Belt. 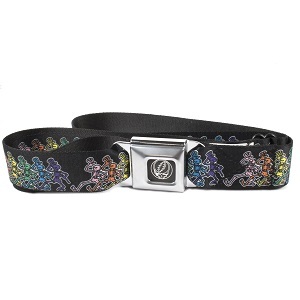 This Grateful Dead belt is made with an authentic metal seat belt buckle with a Steal Your face logo on it. It is 1 1/2" wide, and fits most pants loops. The belt comes in 2 sizes and adjusts easily. Made in the USA. Officially licensed Grateful Dead merchandise.